i've never really been a strong swimmer. sure, i can doggy paddle and i could probably survive if i had to, but i can't dive in and glide through it like all professional and stuff. and i hate having water in my ears and face. it just bugs me. but the teen is a great swimmer. and i want the bean to be, too. 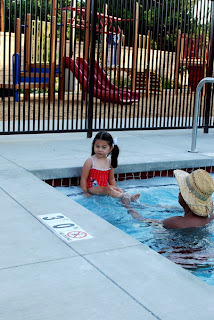 except that when i was finally able to enroll her into swimming lessons, the timing of the sessions just didn't work with our schedules. 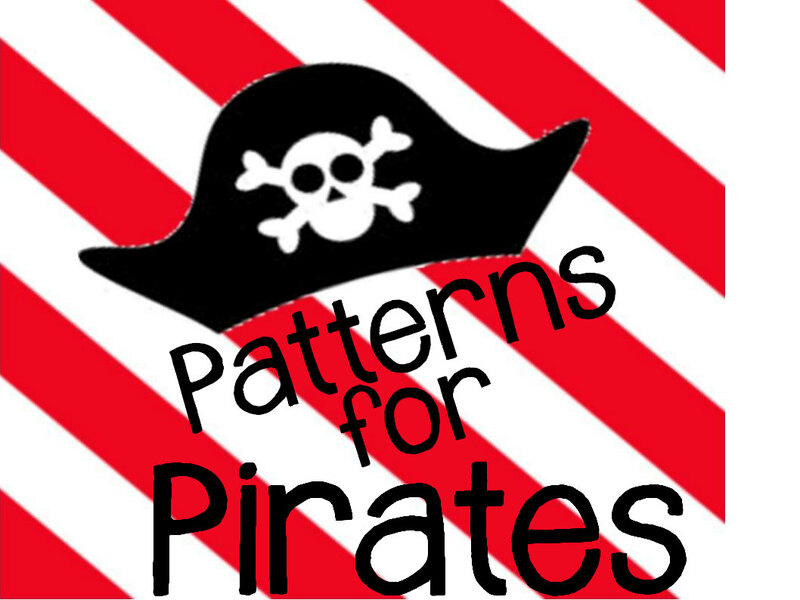 the lessons are two weeks long, with a half-hour session every weekday. well, either we had something planned, or we were going away, or something. so we weren't able to get signed up until way late - with summer damn near over. 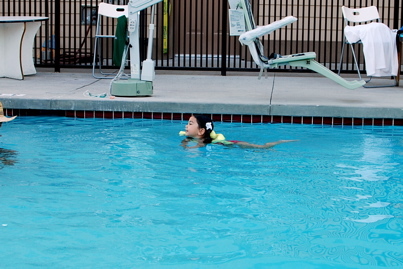 although i guess it didn't matter too much anyway, since it's not like we have a pool for her to practice in. 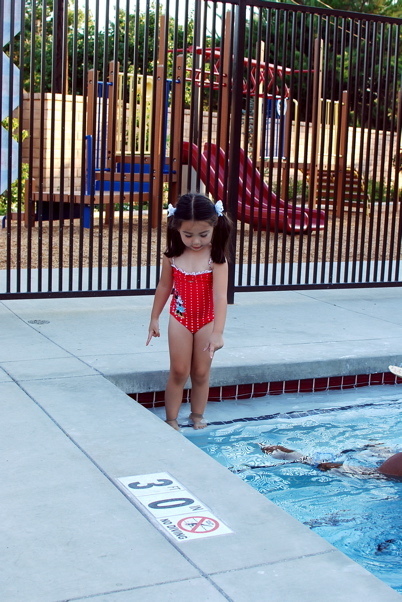 we just want her to learn the basics and water safety and stuff. she was excited for her lessons. the few times that we do get her into a pool, she really digs it. although i was a little worried about how she would handle going in with someone she didn't know, without one of us in the water with her. but she was stoked enough about getting in there that she totally overlooked those facts and got right in. 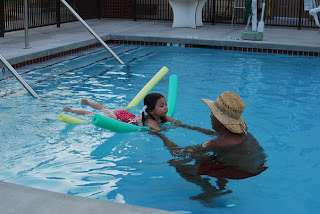 it was fun to watch her giggle and joke around with her instructor, who showed her fun stuff like blowing bubbles in the water and using the noodles to swim without wearing floaties. 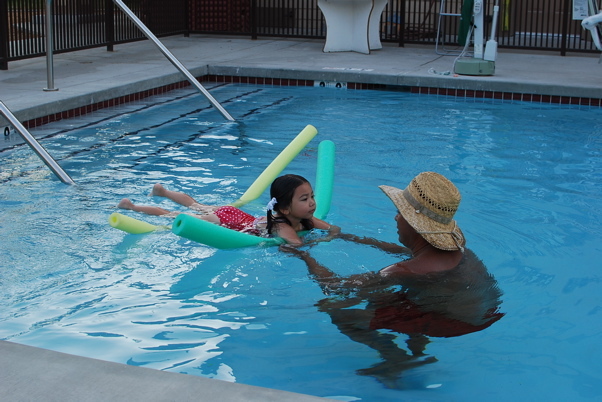 i thought it was pretty cool when he tied one of them around her body so she could swim all by herself. she was pretty proud of herself, too. 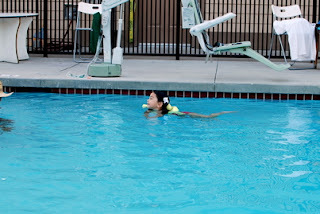 although she wasn't thrilled when he took that same noodle that was so fun a few minutes before, dunked it below the surface towards one of the jets, and let the water flow through it and over her head. that was not her favorite part. damn. she's totally like her mother. we're gonna have to take advantage of the extended fall sessions available at the local pool, because this one is over and we didn't make nearly as much progress as we'd hoped for. oh, well. 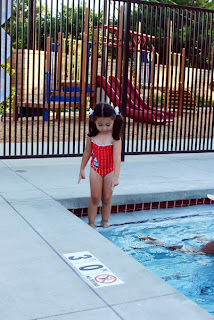 I think it is great that you have the bean in swimming lessons and I'm sure you will be surprised and delighted by her progress and confidence when she is finished. cookies for just 'cause. 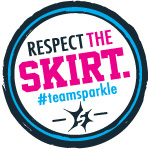 AND for a cause.